Video in online marketing is increasing at an exponential rate. Did you know that in a 2016 HubSpot survey, 43% of consumers wanted to see more video content in 2016? More than that, Facebook users watch 8 billion videos per day. Not sure where to start with video for your social media account? Don't worry, you aren't alone. HubSpot and Wistia have teamed up together to bring you an interactive guide ... with videos! This guide will show you how you can start making videos that are optimized for each social media platform today. If you'd like to skip ahead, simply click on an item in the table of contents to jump down to that section. Get the most out of your videos, social efforts, and content. Start generating leads for free with HubSpot! Shooting a video in the middle of an office can be pretty tricky… that's why we recommend filming in a conference room. You don't need fancy lights to get a good image. Three well-placed lights should get you just the amount of light that you need. Shooting in an empty room can create echo and reverb. This is not only distracting, but it sounds like you're filming in a bathroom! To fix this, you need to deaden up the room. Sound-dampening panels do the trick, but if you're in a pinch, bring in a couch or hang up blankets. The goal is to stop sound waves from bouncing off of the walls. Watch out for distracting, noisy heating vents. Make sure you can turn off the ventilation system in the room where you're filming. If at all possible, leave your studio set up all the time. 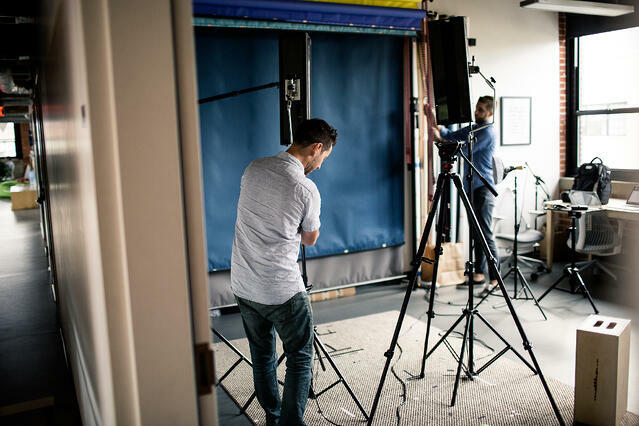 At Wistia, we've found that having a dedicated space to film our videos has allowed for greater spontaneity and simplified the production of new videos. If you're planning on filming multiple videos, and if you can sell it to your team, having a dedicated space can save you a ton of time. Shooting your CEO sitting in a chair with some fake plants in the background doesn't look cool. We prefer to shoot in front of a solid colored background. You can shoot high quality video that's ready to edit and upload to your website using the ever-improving iPhone camera, but if you just pull it out of your pocket and click record, chances are the end result will not look up to snuff. Here are some quick tips for getting the most out of your iPhone's camera. While some of these suggestions are iPhone-specific, many can be applied to other smartphones, too! We're living in a widescreen world! Laptops, televisions, your Twitter feed, and your website are all examples of places where a vertical video probably won't look great. So make sure you shoot horizontally! No matter how steady your hands are, your iPhone is going to have to work pretty hard to stabilize a handheld shot. If you're editing multiple takes, slight movements can be really distracting, so it's definitely worth the extra effort to stabilize your shots with a tripod. Our favorite iPhone tripod adapter is the Joby GripTight, which is around $20. Don't use the iPhone's zoom. Avoid the temptation to use the iPhone's built-in camera zoom. Since the lens isn't zooming optically, you're just enlarging the picture digitally, which means you will quickly enter the world of unsightly pixels. If you want to get a closer shot of your subject, just move your feet closer until you find the perfect shot! The built-in camera flash on the new iPhone will never compare to using off-camera lights. There are a ton of professional lights that you can buy, like a ring light or Westcott's Ice Lights. If you're on a budget, you can also hack together a decent lighting kit from Home Depot for under $100! If you can't get your hands on any studio lights, the iPhone looks great in natural light, so position yourself facing a window and use the sun. 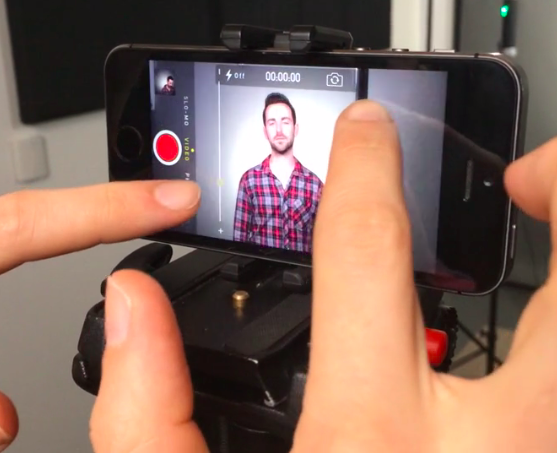 The iPhone will automatically focus and expose your shot. This can be a great function for quick photos, but when you're shooting a video of one person talking to the camera, it can really complicate things. The iPhone tends to keep adjusting and refocusing, which can lead to jittery-looking footage. That's why we recommend using the exposure focus lock. This will help to keep the focus and exposure constant throughout your shot. 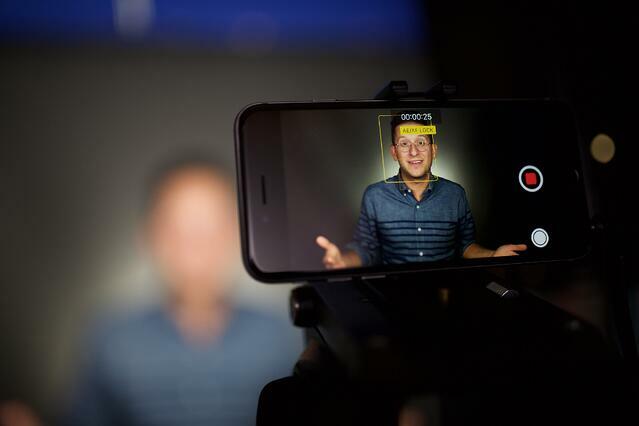 When shooting video with an iPhone, it's best to position a second iPhone directly above the subject's head to record the audio. Creating a simple voice memo should do the trick! Another option is to use an external microphone. You can plug a powered mic, like the Sennheiser ME66, into a KV microphone adapter, and it'll send the audio from the microphone directly into your iPhone. Use a clip-on lens adapter for wider shots. Sometimes, you just need a wider shot, and the iPhone's fixed lens will limit how wide your shots can be. Being able to capture a wider shot is especially handy when you're shooting indoors or in small spaces. A great workaround is to get a clip-on lens adapter. I'd only recommend using something like the Olloclip when you need to get a wider shot, but in those moments, it sure is handy! You can get some amazing shots with the iPhone's built-in slowmo, but make sure the choice is motivated and fits your story. A shot of someone skiing will probably be great in slowmo. A shot of someone typing on their computer, on the other hand, might not be so interesting. There are some pretty cool editing apps available for the iPhone, but they still don't beat editing on your computer. When you finish shooting, plug your phone in, offload your footage, and import your videos into your editor of choice. If you've never edited a video before, there's never been a better time to start! The iPhone's camera combined with some minor editing can unlock some serious potential. Free tools like iMovie have made editing easier for everyone. If you thought you needed to go out and buy a DSLR or to make a video, think again! Sometimes, the best camera is the one you have with you. 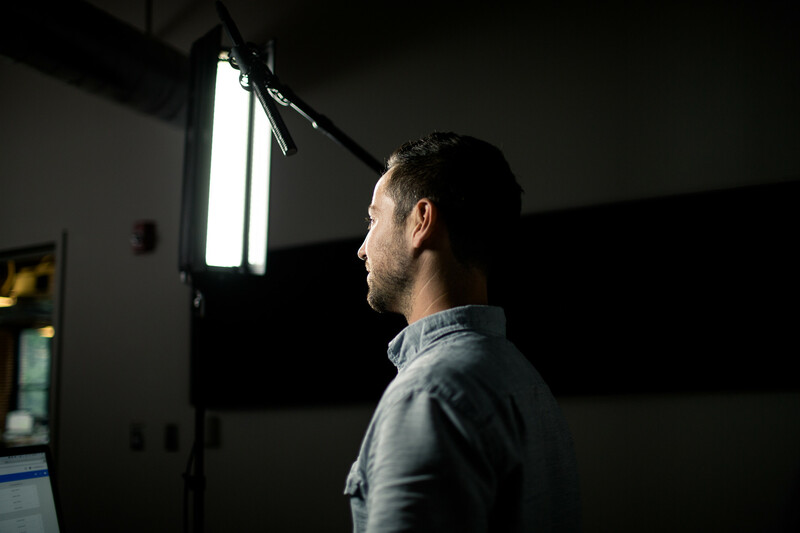 You don't need to have a top-of-the-line lighting kit to make people look great on camera. Obviously it would be super sweet to have a 10-ton grip truck with a crew of gaffers at your disposal, but we don't all have Lucasfilm budgets. And we don't all have hours to throw at elaborate lighting setups! But not to fear, because if you're making your own video, you can still look dapper without breaking the bank. We went to Home Depot and spent less than $100 buying the essential ingredients for a basic DIY lighting kit for shooting an interview. While this is not the be-all, end-all lighting technique, it is an attainable and repeatable way to keep people on camera looking like humans. Sure, you can go crazy with intricate lighting setups, or even use the fabled "3-point lighting" to create some shadows and modeling on your subject's face. But for business video, it's the "Wistia Way" to shoot interviews with flat and even lighting. The goal is to eliminate shadows and create soft, flat lighting on your subject's face. Here's a diagram to help you set up your shot. Be sure to keep the 2 key lights slightly above your subject's eyeline. The light facing the background will help to create contrast and hide the subject's shadow. If there's one thing to splurge on, it's bulbs. Look for daylight balanced bulbs with a high CRI (color render index). This will help to produce the highest quality and most flattering light possible. If you follow basic lighting principles, you can get pretty good results from going lo-fi. Bad audio can ruin even the best video. Consumers of online video recognize subpar sound almost instantly. Like a typo in an article, loud background noise and fuzzy voices suggest inexperience and distract from your message. The good news is, there are many ways to improve the audio in your videos. Optimizing your shooting environment and using quality recording devices can go a long way. The area you shoot in can make a huge difference! The saying "fix it in post" doesn't really apply to audio. It's extremely tough to remove ambient noise from a recording after the fact. Save yourself the aggravation and capture the best possible sounding audio during production. If you're shooting in your office, make sure you warn the folks in the background that you may need to "pull a Spielberg" and ask them firmly to be quiet! Deaden room reverberation by taping blankets to the walls. You could also invest in acoustic panels that help remove room reverberation. A lavalier is a small microphone that clips onto your speaker's shirt. Lavaliers are a great option if your talent is going to be moving around, and there are both wired and wireless versions. However, lavalier microphones are particularly finicky. Whether or not they'll capture good audio depends on getting the perfect placement. Start by placing the lav about six inches below your talent's chin. Your goal is to make sure that the microphone has a clear path to the mouth. 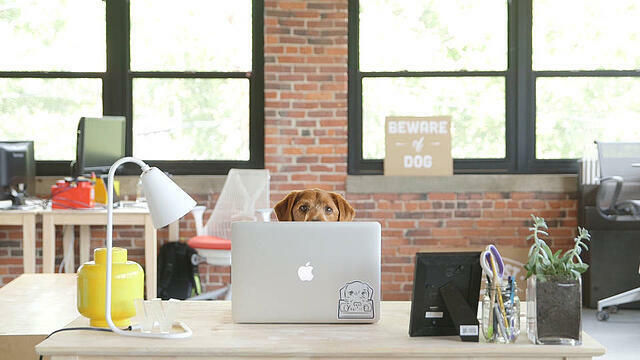 At Wistia, we are constantly trying to make our production process more simple and less intimidating. That's why we prefer to keep a shotgun mic positioned and ready for action in our studio. With this setup, subjects can jump in and out of the space to shoot videos on the fly. We love the shotgun mic because it can be hidden outside of the shot (and the talent's field of view), and it makes subjects' voices sound close and clear. It also picks up a bit of ambient noise to provide a nicely balanced soundtrack. We broke down our recording process using a Canon 5D on the blog. We recognize that there are all sorts of sound solutions out there, and we are excited to keep discovering new ways to record clean, crisp audio tracks. Support videos are just about the most efficient tools under the sun! By placing valuable knowledge in your customers' hands, you can spend way less time repeating explanations, and more time delving into deeper issues. When you set out to make a support video, you should always start out with a script. Writing out a script will keep your production process organized and your messages clear and concise. Try your best to keep the focus of the script narrow. Covering too much in one video can be overwhelming for both the customer and the video team! Keep in mind that you can always make a supplementary video later on to add more information. When you're feeling solid about your script, do a table read. In other words, gather some friends and read the script out loud. Listen for phrases that might sound awkward or confusing and revise the language until it flows nicely. This is also a good time to begin thinking about the actions that you'll be showing in your screencast as certain sections of the script are read. After your script is ready, record your voiceover! We like to do this before shooting the screencast so we can follow the audio cues. Before beginning to record to the voiceover, split your script into manageable chunks. This way, you can move through the recording process one section at a time and keep track of your progress along the way. At Wistia, we like to use Apple Soundtrack to record our voiceovers, but you could also use Garageband, Quicktime, or even Screenflow! Before you start to record a screencast, listen to your voiceover a few times and practice the actions you are going to make. When you start to feel pretty familiar with the timing of the actions, go ahead and begin recording your screencast while listening to your voiceover. We like to use Screenflow to record our screencasts, but there are also some great free options out there, like Screenr or QuickTime Player (on Apple computers). Keep in mind that you probably won't record a perfectly smooth screencast on your first try. It takes some practice to learn the timing of all the steps. You'll know it when you see it. Remember that you can always fast forward through longer processes (e.g. videos loading) after you finish recording the screencast. We like to use live action video bumpers to help us make a personal connection with our audience. As much as we love a polished screencast, a few seconds of smiling faces in the beginning and end of your videos will keep your viewers way more engaged. Side note: When shooting the live action footage, try your best to keep the sound quality consistent with your voiceovers. If possible, use the same mics and environment that you used to record the voiceovers, so that the audio for the overall video sounds cohesive. Empowering your customers with knowledge is one of the best investments you can make. By replacing repetitive phone and email conversations with concise, friendly videos, you can save hours of your time and form memorable connections with your audience! In Chapter 1 of this digital guide, you learned how to create high-quality videos for social media. Great! Now, let's make sure those videos fit within each social network's best practices. Creating and posting videos on social media should always help you drive toward your existing marketing goals. For example, if your goal is to get more people to download an ebook, you could create a short teaser or how-to video and post the full link to the ebook's landing page in the copy of your social post. Let's drill down into best practices for each social network. Promote a new blog post, engage with your audience, or even drive viewers to a landing page with Twitter videos. When teasing a blog post or piece of content on Twitter, always keep your video short and sweet – brevity is a core factor on this channel. Short clips that are easy to consume tend to perform the best. Try pinning your video to the top of your profile for some added exposure. If you want to get a little more experimental with using video on Twitter, you can try making short, custom videos to engage with your audience. 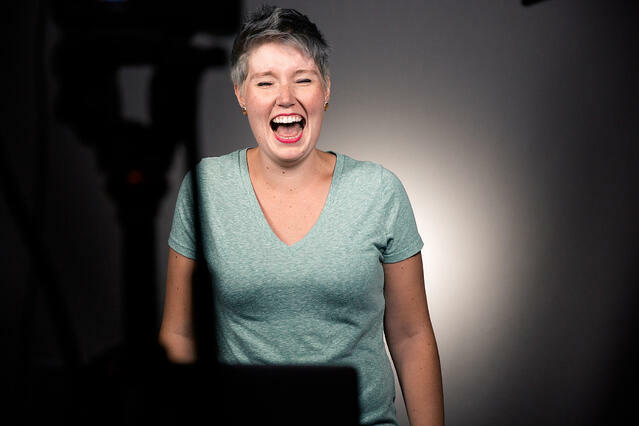 These highly personal, one-to-one response videos are an awesome way to make your brand more human while building personal connections with your engaged followers. If you happen you be a Wistia customer, you can use video in a number of ways on Twitter. Create a Twitter card and collect leads from right within your videos with Wistia's Turnstile feature. You can also easily locate and share your videos on Twitter with Wistia's new Chrome extension! When you walk onto a bus or train for your morning commute, how many people are scrolling through their smartphones to see the news and content they've missed overnight? Pretty much everyone – but not everyone is wearing headphones. Make sure your video works with or without sound. It used to be best practice to keep your Facebook videos under a minute long, but the social giant recently announced that they will start favoring longer videos in their newsfeed algorithm. The goal with this shift is to better surface videos that are most relevant to the viewer. So what does this mean for you? Don't panic; this just confirms what we already know is true. Creating the "right" content for your audience is more important than churning out it out for the sake of it. Upload videos directly to Facebook. 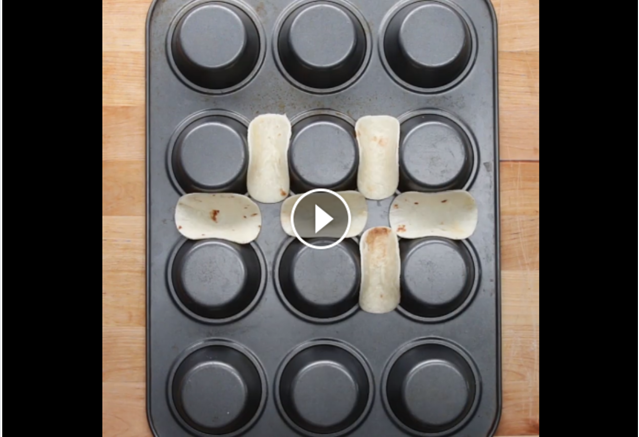 Facebook continues to make a compelling case for uploading your videos natively to the platform. The primary reason being, your content will be seen by more eyes that way. 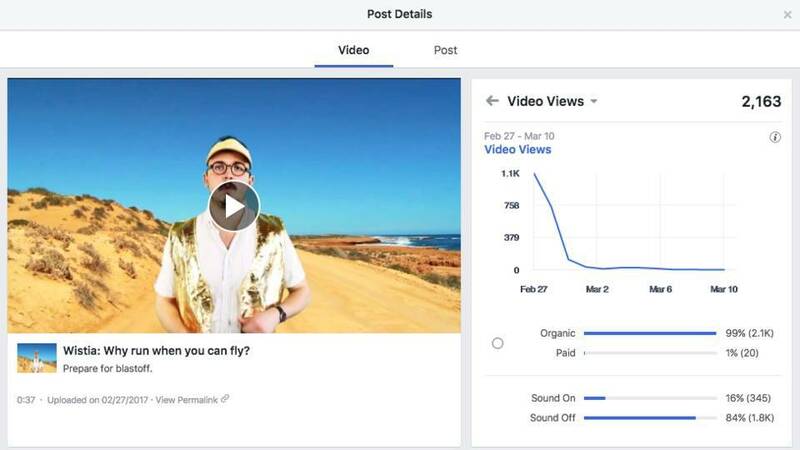 Brand awareness videos that are light-hearted and entertaining tend to perform well on Facebook for this very reason – their algorithm Takes into account a user's previous video-related actions when determining what videos to show them on subsequent visits. Make a video that's super relevant to your audience, share it on Facebook, and see what type of engagement you can drum up! Grab attention instantly... and keep it. Did you know that Instagram was the first social channel to initiate silent, auto-playing videos? It's true! Shortly after, Facebook followed suit, so it's safe to say that catering to this type of video when creating content for social media is the way to go. It might seem daunting to try and grab someone's attention so fast and without sound, but here are a few best practices you can use to make things easier. Start off your video with motion to grab your viewer's attention while they're scrolling through the feed. Incorporate text or include captions so that viewers can follow along with or without audio. Post with a specific strategy in mind. Think of YouTube as a giant library of video content where people go to either educate themselves or to be entertained. YouTube reports over 1 billion unique users per month – sounds like a social media gold-mine, right? Well, sometimes, yes. There are, however, a few questions you should ask yourself before going forth with posting every video you've ever made to your YouTube account. Can you make the specific video content they're searching for there? Do you need these prospects to end up on your website? If you're purely seeking some broad brand awareness, YouTube could be an awesome channel for you (just don't expect much in the way of driving tons of traffic back to your site). Establish and grow a dedicated channel of subscribers by creating informative, educational content that is in high demand, and you'll start to see some real success! For a long time, LinkedIn was one of the less video-friendly social networks, but in 2017 that changed. Users can now upload videos, and brands (whether that's your company brand or personal brand) can now get even more creative with the content they share. Considering this fairly recent development, what should you be considering when creating and uploading LinkedIn videos? Ideas for video content on LinkedIn. If you're in a fast-paced industry that's always evolving, brands and thought leaders can take the lead by showcasing new technologies in video format, or providing tutorials on how a new physical product works. Video is the perfect medium for giving audiences a taste of what it's like to really be somewhere. The most obvious use case here is industry conferences and events. If your company hosts them, uploading videos of the event to LinkedIn is a great way to demonstrate the buzz you're creating in your industry. If you're working on your personal brand, bringing snapshots of the things you're learning at the event to your connections can be the perfect way to help your community or develop your own thought leadership by sharing your perspective of everything that's happening there. If you have a time-saving hack to share or have learned something new that might help other people in your network, video is a super effective medium for sharing that knowledge. 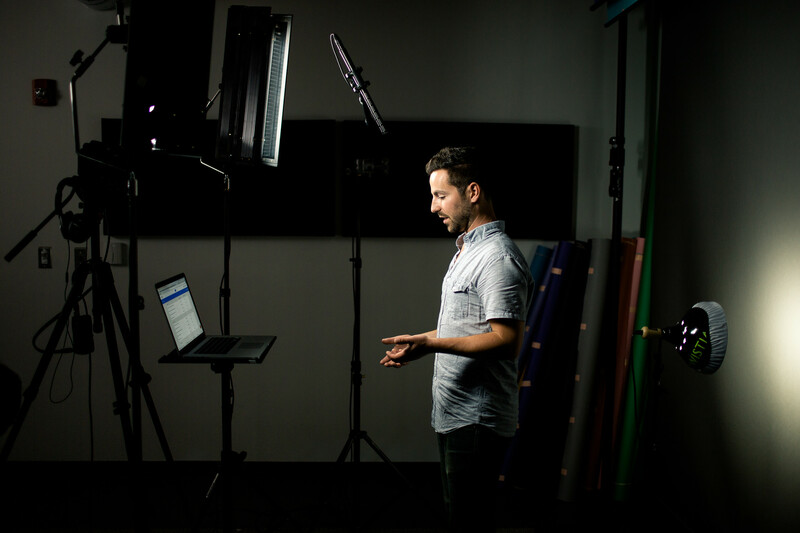 If you're thinking about this on behalf of your company, ask yourself what your buyer personas often struggle with, and see if you can teach them a solution in video format. This is one for the opinionated amongst us. If you have thoughts on a recent announcement or piece of industry news, let people know what you're thinking in a video! 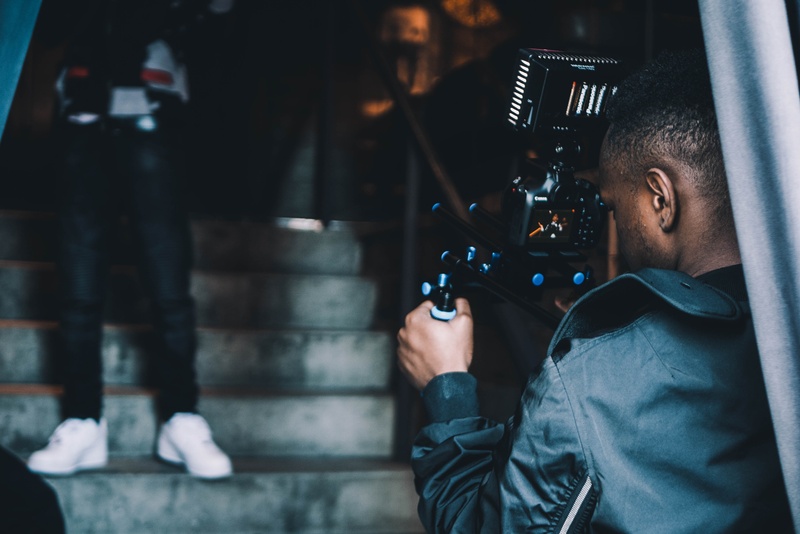 Likewise, if your company has some news, or has made a recent key hire that your followers and wider industry would want to hear about, a video is a personable take that can be used alongside the traditional press release. Of course, you don't have to stick to these four themes -- get creative and test, test, test to see what works best for you. Upload videos directly to LinkedIn. While Instagram's traditional features let users record short video clips and post them online afterward, new live features on Facebook and Instagram take a different approach, allowing users to post live video streams of what they're doing at that very moment. When you’re setting up videos for Facebook Live or Instagram Live, make sure you’re following the steps in the first section of this guide. If you do this, you’ll have much higher quality live videos, which will set you apart from other live videos being shown. In addition to these steps, we have a few more things to keep in mind. It's a bit too early in the game for there to be benchmarks for which time windows will get you the most views, But, keep in mind that you live video will be broadcast from the platform (Facebook or Instagram) itself, so that's where you'll be promoting your broadcasts primarily -- so do some research on your Facebook/Instagram audiences to find out when they're most engaged with your posts. Even if some of your followers miss out, the app will save your videos to the app by default (although you can delete them manually if you want to), and they'll be available for viewing by your followers after the fact. Spend time coming up with a compelling title. Sometimes, the most effective title will tell people exactly what you're going doing in the video. For example, Elijah Wood once posted a live video with the title "Jellyfish" whilst visiting the aquarium -- which is exactly what the video showed; nothing more, nothing less. Another example? When Engadget broadcasted a video with the title, "Watch our live unboxing of @Microsoft's @Surface 3 now!" Can't argue with that. A title that lets users believe they're seeing exclusive footage can be super compelling. For example, you might broadcast a video titled, "I'm live from my show!" for all the viewers at home. Another version of this could be "A Back-Stage Look Into..." or something along those lines. Broadcasting something unique, rare, or just plain weird? Own it. One of my personal favorites was, “My fridge: 100 viewers and I’ll drop eggs." One of the coolest features on Facebook is that people who are watching your stream in real time can comment and "like" the broadcast (which show up as hearts, like on Instagram). Other viewers are able to see these comments and the number of hearts your video has. Acknowledge or even respond to these comments out loud on the live broadcast to encourage engagement and make the experience feel like more of a two-way conversation. Since Facebook and Instagram Live features are still relatively new, there aren't solidly defined ways to use it, especially for brands. This is a unique opportunity for you to experiment with different ways of using it and what type of content your audience likes most. Facebook Live lets you analyze a few key stats you'll want to keep track of while you're figuring out what works. Once your video ends, the app lets you see how many live viewers you had, how many viewers replayed your video, and how many hearts your video received (this number updates automatically as users continue "liking" your video from the time it ends until it expires). 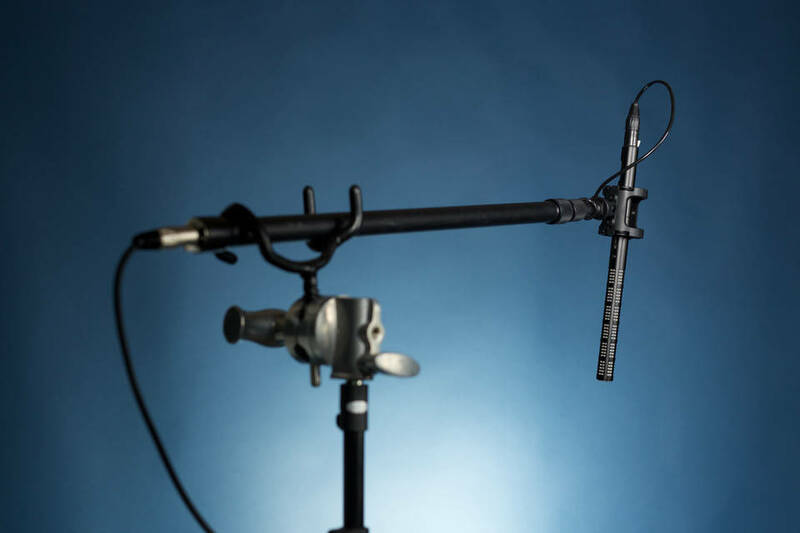 Finally, as you experiment with different recording environments, keep in mind that background noise is easily picked up by microphones -- so you'll want to make sure you're in a relatively controlled environment if doing a more serious or professional broadcast. Now that you have an idea of how you should use video on social media, let’s hop over to how you should measure that content. Use the best video for business platform on the market to host, track, and analyze your videos. Now that you have an awesome strategy for video creation and implementation, you need to determine if your efforts were worthwhile, and how much real value they drove for your business. There are three places you will want to look to measure video success: 1. On the social media platform, 2. In your video tool and 3. In your marketing automation tool. This will help you determine exactly what value was driven from your videos, and what needs to be done to iterate on them and ultimately improve them in your next campaign. Looking directly in the social media platform gives you some valuable pieces of information. You can look at the number of people reached, video views, and the comparison between your video posts vs. other types of posts. This information is valuable to determine whether video really is the right content type for your audience. You can also compare which video topics do best for your audience, by looking at the engagement of your video posts compared to others. Let’s start with Facebook specifics. Facebook has one of the most robust video analytics within their platform of any of the social media platforms at this point. Under video details you are able to see: audience retention throughout your video, average duration, video views, and repeat views. Audience Retention and average duration: Do people watch all of your video, or do the majority of them leave? Ideally, you want as many people as possible to watch the whole video. If you are struggling here, try making your video shorter, or see what is going on in the video when most people fall off. 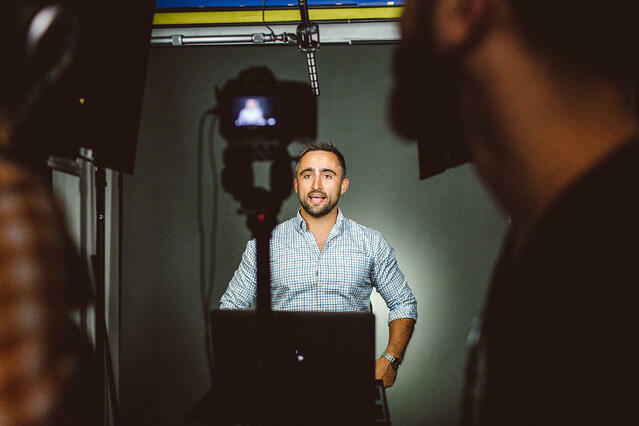 Have you give your value proposition by that point in the video? If not, maybe you need to adjust your future videos to have your call to action earlier on, so that you get more value out of the people who are watching your video. Video Views: Pretty straight forward here, but this is the number of people who have viewed your video on Facebook. 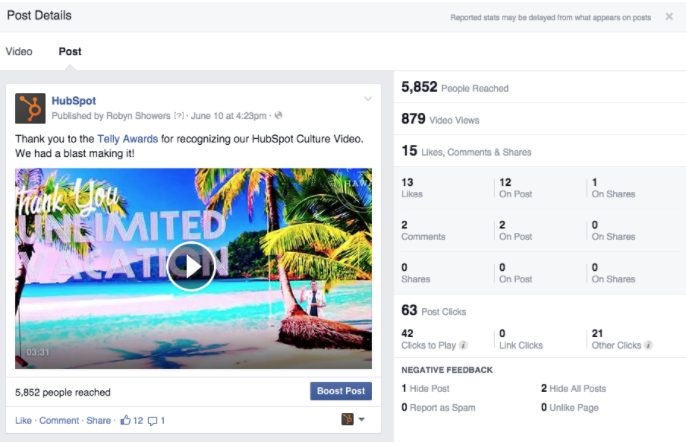 You can break it down in Facebook by paid vs. organic views and auto played vs. click to play. What is beneficial here is the slightly manual progress of determining your engagement rate. Take the video views, and divide it by the total reach of your video. This is the engagement rate of your video. By keeping track of this, you can compare how one video post performs compared to another. Repeat views: The higher this number is, and the higher is it as a percentage of total views, the more engaged your current video viewers are! Under “post details” you can see additional information, including reach, likes and shares. This is Facebook specific data. This information is similar to the post specific data you are likely used to seeing on Facebook. It is useful in determining which post types and topics are most engaging with your audience. By breaking down the total engagement by likes, comments, and shares, you can get a clear view of what content will perform best with your audience. Test out as much as you can, and keep track of what works and what doesn’t. This will help you determine your future strategy. Analytics on Twitter are pretty straightforward as well. 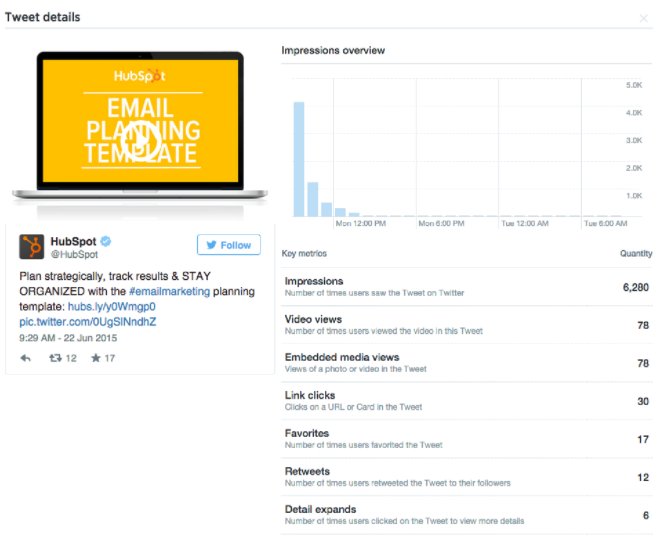 You can check out impressions (reach), video views, link clicks, and engagement. This information is helpful to marketers when determining what content to post based on their goals. If your goal is to get as much interaction as possible (favorites, retweets, etc) post content that has historically seen high engagement rates. If your goals are based on link clicks (meaning clicks to your website), then stay away from content with high engagement, and focus on posts that have a higher percentage of link clicks. All this information can be found in Twitter’s in app analytics. Instagram’s analytics are limited, unless you are an advertiser. For now, you can see which topics saw the most likes, which should be tracked to determine which topics do well with your audience. It is a bit of a manual process, but worth it! Across all platforms, you want to be sure to measure views over time, to determine the life of your videos. You may find that videos need to be refreshed every few weeks, or months, in order to stay relevant with your audience. 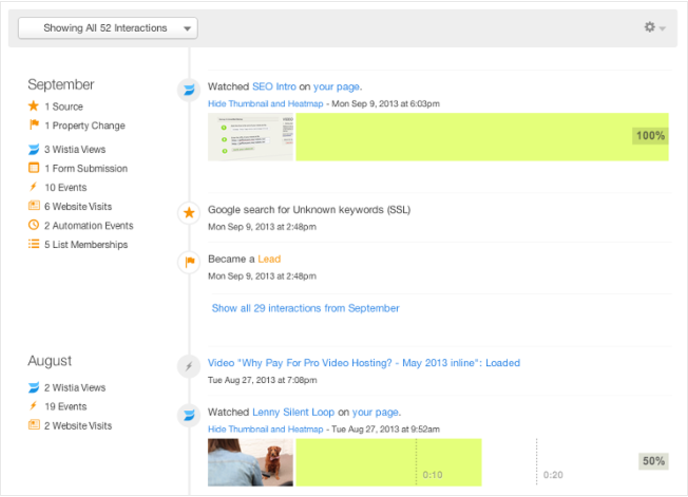 You also want to always be tracking and comparing engagement of your videos. This will help you determine which topics encourage the most sharing, and therefore will have a higher and longer lifetime value. Now that you have all the information you can get from the social media platform natively, let’s look at what you can see from your video tool. Video hosting tools, like Wistia or Youtube, can show you more information than social media platforms alone. Below are four measurements you should be looking at as a marketer if you are trying to ultimately drive more sales from your videos. Definition: The number of times people rewatched all or part of your video. Using this metric, salespeople have the potential to be far more successful at making a sale. By focusing on which sections of the video have been rewatched by an individual lead, they know exactly which pain points to address once they get on the phone. For example, a salesperson might take extra time explaining the enterprise product price structure because he saw that his lead rewatched the section on pricing three times. Mike goes into every call even more prepared because he already knows what the lead is concerned about -- and he has a solution that could help. Marketers can also use this metric to build super-targeted email lists. Let's say a marketer wanted to nurture leads to become a qualified sales lead, he or she could segment a list based on the number of rewatches. For example, those people who have a high number of rewatches could be closer to becoming a hot sales opportunity, so a marketer might want to send them one more juicy piece of content in the hopes of converting them. Definition: The proportion of how long an audience member watches your video divided by total video length. Average engagement rate refers to the proportion viewed divided by all audience members. Engagement rate tells you how interested someone is in your company or message, while average engagement rate tells you how compelling your video is, generally. For salespeople, the engagement rate is powerful because it lets them use their time efficiently. It indicates which leads are most interested, helping the salesperson target those who are most likely to buy. For marketers, average engagement rate is powerful because it indicates whether a video is holding people’s attention. This can help marketers create more engaging and profitable videos in the future. 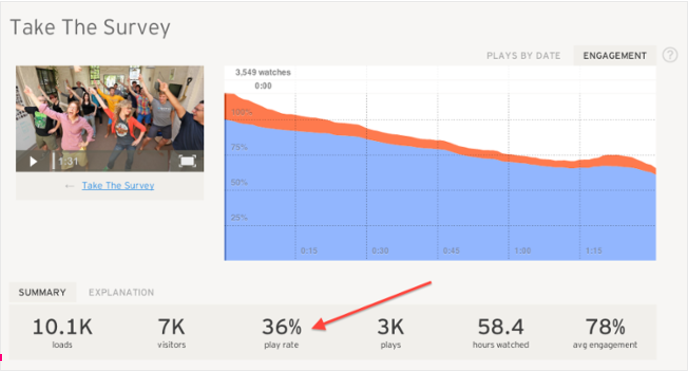 For example, my company, Wistia, has found that shorter videos have higher engagement rates. This was no huge surprise, admittedly, but it did help us clarify our strategy of being as succinct as possible. Definition: The proportion of people who play your video of all the people who view it; this equals the number of plays divided by the total number of loads on the page where your video lives. Ideally, you want to achieve a play rate of 100%, since the play rate indicates whether your video seems appealing to watch. If people visit your page but don’t hit play, this suggests that the title, thumbnail image, or description need some work -- all of which your marketing team can easily tackle. A trend of low play rate across multiple videos can also give marketers insight into which topics are most appealing to the audience so they can capitalize on engaging topics in future videos. Your video tool will give you a much more detailed view of video trends over time. Whereas in social media platforms, you need to manually compare video post to video post, in a video platform, all the data is right at your fingertips. Check out which of your videos continuously see high traffic. Why do these videos see high traffic? Are they ranking for keywords in Google? Are they in an email campaign you promote a lot? Use this information to improve your marketing around video, as well as to drive ideas for upcoming content. You can also measure total video views from all your videos. This is a cool place to start setting total video view goals as a company. Similar to how we are HubSpot have a leads per month goal, we now have a video views per month goal! Tracking the success of a video campaign is critical in today’s world, to prove that it is worth it. Driving 50k views is great, but what did it really do for your business? Take your analytics to the final step to close the loop, and integrate your video platform into your marketing analytics platform. If you are a HubSpot customer, the good news is that Wistia already integrates with HubSpot, and you can easily see everything we just discussed in all parts of the platform, including contact records and reports. Let’s dig a little deeper into the various things you should measure in your marketing tool related to video. Video should be integrated into everything you do, and help you throughout the funnel, and your measurement should be in all parts of the funnel as well! Marketers can track the number of visits to their site came from video campaigns, by using similar tracking tokens. Most video marketing campaigns will either have your video hosted on a website page (landing page) or natively in the social media platform. Both are great, depending on your goals. If you are hosting a video on a website landing page, create a campaign related to the specific video, and use that campaign tracking token for all of promoting of that page. This is especially useful if you are promoting a product video on a page that has additional product information, as well as a call to action to get a demo or free trial of the product. If you are hosting your video natively on a social media platform, you can already tell how many people viewed your video on the platform, but you also need to determine how many people visited your site from your post. In each video post, also include a link to your site, and make sure you have a unique tracking token there as well. Measure both how many people’s first touch on your site is attributed to a video of yours, as well as how many people were assisted during their buyer journey by one of your videos. For more information on attribution reporting, check out this blog post. 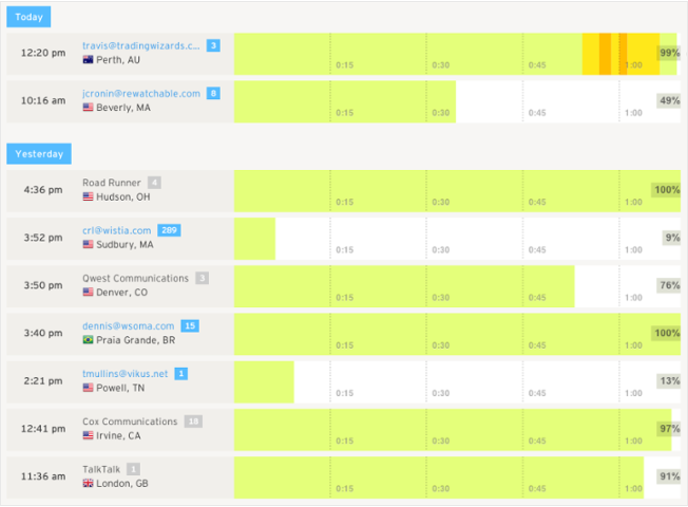 Many video platforms, including Wistia, have a lead capture option. By turning this on, you are capturing the contact information of people who are interested in more of your content. If you aren’t using a platform that can capture leads, be sure to have a strong call to action to download content after someone views your video. These people can be directly associated with your specific video. We suggest nurturing these people in a personalized way, in order to convert them into customers at a high rate. Since you know very specific things about them (they viewed a very specific video) you can customize your email nurturing campaigns accordingly. Now that you have proper lead tracking in place, you can easily determine how many contacts from a video have converted into an opportunity with your sales team, and into a customer. Pro tip: Let your sales team know if someone has viewed a certain video. This could help aid their conversations. Videos in your marketing are not a one and done kind of deal. You need to be constantly measuring and iterating on your ideas, formats, and promotional efforts, in order to get the most out of your campaigns. Just like any other type of marketing, video can work for you, if you put the right amount of time and effort into it. You need to be able to gauge the effectiveness of the videos that you create, and this means paying attention to video metrics. If you’re doing video (which you should! ), the strategy should be integrated with everything else you do. With the proper metrics and tools, you'll keep your leads and customers happy and engaged, and your marketing and sales teams successful. And what could be better than that? Throughout this guide you've learned how to create high-quality videos on a budget. You can use an iPhone and a simple lighting kit and you can actually create some really great stuff. You've also learned best practices for how you should post videos on each social network -- and maybe you'll even notice video content more in your own social media feeds. Finally, you've learned how to actually measure videos and figure out if they're helping you hit your bottom line. Remember to always tie your videos to a real marketing goal and think about how that video content can help you achieve these goals. Ready to start incorporating videos into your marketing strategy?